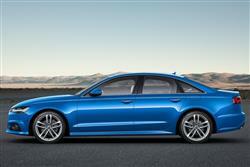 Find out everything you need to know on the new Audi A6 from independent vehicle review website Car And Driving. You can watch the video review to the left to see more of the car or read their written review below to get a true insight from an expert in the automotive industry. My first instinct is that Audi's A6 is very much a masculine car. It reeks with gizmos and gadgets and understated luxury. When I was younger, I found executive saloons and estates like this a little intimidating, yet respected the strange sense of class they offered. This is not the kind of car you would want to try to beat at the lights. Especially not if the model in question has one of Audi's more powerful diesel units fitted. My four-door test car was a lot more practical than I expected. The boot operates a rail system and fixing set, which means that loads can be fastened securely. There are also great storage solutions with everything from executive drinks holders to a compartment holding a comprehensive first aid kit. Audi likes to maintain a strong family resemblance across its model range and the current A6 falls into line with its showroom stablemates. The short front overhangs give the car a dynamic stance, helped by the relatively low roof line and quite aggressively tapered rear. It's a very assured piece of styling although not one that provoked too much reaction during my test. When this fourth generation design was originally introduced in 2011, the Ingolstadt designers lengthened its wheelbase by 70mm to improve rear seat accommodation and create a cabin that remains exceptionally light and airy in this model. There's ample leg and head room for a couple of six-foot adults to stretch out in comfort and, with the broad centre armrest tucked away, even enough room for a third to sit between without having to breathe in first, though that person will have to straddle a fairly hefty transmission tunnel. Out back, the boot is pretty big. Raise the wide-opening lid and you'll find 530-litres in all. Like all of the cars in this class, this one denies its owner the standard fitment of any sort of spare wheel, instead merely providing one of those fiddly tyre inflation kits. If you need more space, the trunk can be extended to 995-litres by flipping forward the standard split-folding rear seats. All of which may be enough to preclude some from having to consider the greater capacity of the Avant estate version. It's smooth and very relaxed at the wheel - but then what else would you expect? My other half loved it. Time to talk engines, which in the mainstream line-up are exclusively diesel-powered these days. Though Audi does also offer a potent 4.0 TFSI petrol turbo unit here, its use is restricted to the top sporting models, the 450PS S6 and the 560PS RS6. Otherwise, the choice lies between various versions of the familiar 3.0-litre V6 TDI powerplant with quattro 4WD. Or the version that I tried, the front-driven 190PS 2.0 TDI, a car capable of a very reasonable turn of speed, 62mph from rest achievable in 8.4s en route to 144mph. This is the only A6 variant available with a manual gearbox, but most buyers will continue to prefer an automatic. These days on a four cylinder A6, that means Audi's slick 7-speed dual-clutch s tronic unit rather than the thrashy belt-driven CVT 'box this derivative used to have. Most A6 models will be sold in the £35,000 to £50,000 bracket common to this class of car. Beyond that lie only the powerful S6 and RS6 sporting models, priced respectively from either £58,000 or £82,000 and now alone in the line-up in their use of petrol power. Otherwise, diesel engines dominate across the standard A6 range that's our focus here. Within it, you'll be either buying a saloon or considering the £2,000 model-for-model premium that Audi charges for the Avant estate bodystyle. Despite power increases across the board in this improved fourth generation line-up, the EU6-compliant engine range benefits from emissions reductions of up to 22%. All of that plays its part in allowing this car to achieve an impressive set of balance sheet returns. Go, as many potential buyers will, for the entry-level 2.0 TDI Ultra version I tried and you'll be getting a very efficient car indeed. It's capable of as much as 67.3mpg on the combined cycle, hence the impressive 1,030-mile potential operating range you'll get from the 73-litre fuel tank. And up to 109g/km of CO2 is possible with 17-inch wheels and the efficient s tronic auto gearbox fitted, which will relieve owners of the need to pay for road tax in the first year of ownership. Bear in mind that with manual transmission, your fuel and CO2 returns will be a fraction worse and, as you'd expect, the heavier Avant bodystyle will impact both sets of figures by a few percentage points, as will the larger wheels you get with plusher trim levels. Were I to be choosing between a Mercedes E-Class, a BMW 5 Series or an Audi A6 (as most potential buyers will be), then I could certainly make a strong case for the Audi, having spent some time with one. It has a cooler, more under-stated image than its German rivals and the most recent tweaks have given the car a little more identity. All of which could be enough to make the difference for a significant number of buyers.